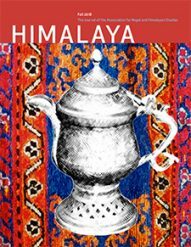 The Association for Nepal and Himalayan Studies (ANHS) is pleased to announce the appointment of the next editors of its flagship journal, HIMALAYA. Mona Bhan and David Citrin have agreed to take over leadership of the journal beginning with Volume 38, to be published in 2018. Dr. Bhan is an Associate Professor at DePauw University, where for more than ten years she has taught courses on globalization, South Asia, and militarism. Based upon field research in Kashmir, Bhan has published articles in Critique of Anthropology, the Journal of Asian Studies, South Atlantic Quarterly as well as her 2015 book Counterinsurgency, Democracy, and The Politics of Identity in India and numerous articles in South Asian media outlets. Dr. Citrin is faculty in the Departments of Anthropology and Global Health at the University of Washington and founding co-director of the Nepal Studies Initiative, affiliated with the South Asia Center in the Jackson School of International Studies’ South Asia Center. Building on his work with the Cornell Nepal Study Program, Citrin has helped establish new opportunities for Nepal studies through the University of Washington. He also continues his work with Possible, a Nepal-based NGO that partners with the Ministry of Health to strengthen public sector healthcare delivery systems. David and Mona bring to the journal their long-term connections to the Himalayan region. In their application for the position, the incoming co-editors stressed their commitment to maintaining the high quality and peer review that HIMALAYA is known for, and that they will continue to reach out to scholars in the region, as both authors and readers of the journal. David and Mona are firmly dedicated to publishing scholarship about all areas of the Himalaya and from a diversity of disciplines. The ANHS is delighted that Mona and David are eager to take on this important work, even in an era of challenges for independent academic journals. The new editors and ANHS Executive Council would like to express their great appreciation for all that the current editors, Sienna Craig and Mark Turin, have done with HIMALAYA over the past years. Drs. Turin and Craig oversaw a major resdesign, introduced new submission categories, and have helped to position HIMALAYA at the forefront of open access scholarly publishing. They will turn over a robust and internationally regarded journal with a wide readership to Drs. Bhan and Citrin in early 2018.